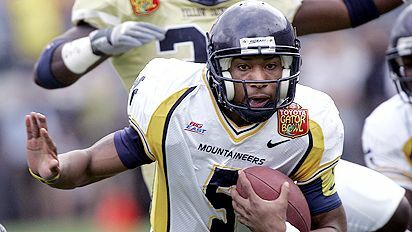 West Virginia QB Pat White stole the show in the second half, directing the offense to an 18-point comeback without one of the Mountaineer's biggest threats -- running back Steve Slaton. White did a great job of making plays, and the offensive line did their job protecting him and opening up holes. White gives coach Rich Rodriguez another running back; he is explosive, very tough and can take on defenders. He carried this team on his back -- and his legs -- and proved he is the true MVP of this team. Plan a trip to your favorite team's big game with ESPN SportsTravel's Bowl Travel Guide. Here's your chance to be the expert and pick the Bowl winners. Create your FREE entry and compete for a chance to win a home theater system. For more information on the Toyota Gator Bowl please visit the official bowl Web site. An injured Pat White willed West Virginia to a 38-35 win. Pat White said it was over. The sophomore sensation was quarterback, running back and coach in West Virginia's 38-35 defeat of Georgia Tech. White. Without teammate Steve Slaton to carry some of the weight, White took over, completing 9-of-15 passes for 131 yards and two TDs and running for another 145 yards and a score. Kudos also go to Georgia Tech's Taylor Bennett, who tossed three TDs while filling in for the academically ineligible Reggie Ball, and receiver Calvin Johnson, who caught nine passes for 186 yards and two TDs. 132, 143. Pat White rushed for 143 yards -- 11 more than he passed for. White is known as a running quarterback, but this was just the fourth time this season that he has passed for less yards than he gained on the ground. Pick all the bowls: SN vs. Schwab! Click here for individual projected statistics.